Skydiving is an incredible gift and an amazing adventure for someone special. Here are some tips to get the best value for your money and make sure your lucky friend gets the best experience possible. 1. Shop with the skydiving center directly instead of third party vendors. You will avoid paying extra fees and get the most accurate information on the skydiving experience itself, booking process, any limitations and refund policies. Third party vendors often won’t even tell you where exactly you will be skydiving. Since you want to be sure that you’re sending your friend to a professional and reputable skydiving center, get the gift card from them directly. If you have any questions, call the skydiving center’s office directly and get first hand information. 2. Add the picture and video package to your skydiving gift certificate. Both you and your friend can “relive” the jump again and again watching the video! It’s like jumping again, the thrill comes back every time. 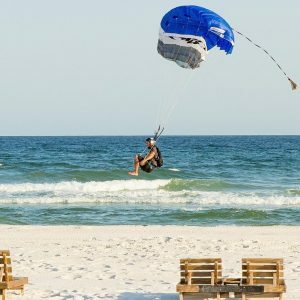 At Skydive The Gulf, our instructors shoot professional video, giving you an unique ariel view from start to finish. 3. Read the terms and policies. Is the gear rental included? What are the age and weight requirements? What altitude will they be jumping from? Some places will offer a discounted gift certificate for a lower altitude, and try to upsell you to a full altitude when you check in. Also check the refund policy. 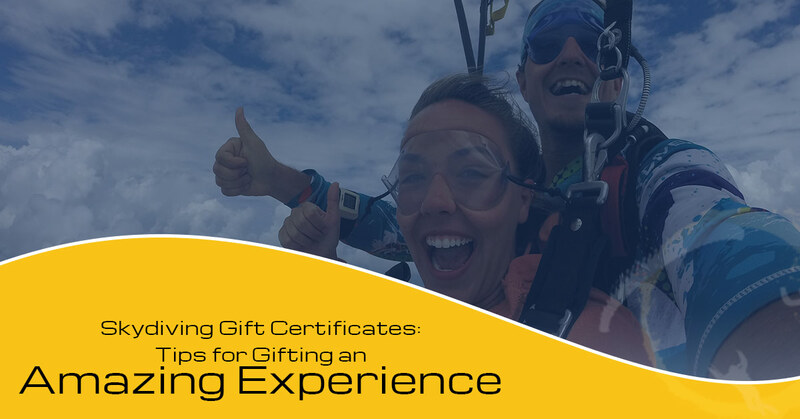 See how long the skydiving gift certificate will be valid for. Is the skydiving center open year round or summer months only? What if you need to transfer your gift voucher to someone else? How will it be delivered, and is there any shipping cost? Your recipient has to be over 19 years old on the day of the jump, has to weigh under 260 lbs. You will get your gift card by email seconds after checking out! You can choose to get it emailed to yourself, or straight to your recipient. The skydiving gift voucher has to be redeemed within 1 year of the date of purchase, which is plenty of time since we’re open all spring, summer, and fall. The gift voucher will be transferable – anyone can redeem it! Our gift cards are also non refundable, so no backing out, let’s jump! 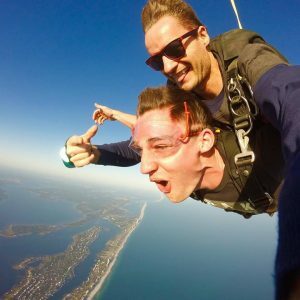 The rest is super easy – just have your lucky friend print out their skydiving gift voucher and call or book online to schedule their jump! Come along with them to jump together! Or even just to watch… See their excitement build up as they get harnessed up. Watch them board the plane, watch their canopy open and see them land and squeal from happiness! All the great emotions and experiences that you’re giving them are priceless and they’re super lucky to have a friend like you! Are Tandem Skydive Instructors Afraid Of Heights? ©2017 Skydive The Gulf® - Do not copy. All rights reserved.